through the Hero project funded by The Children's Institute (part of University of Cape Town) which involves Bridget, who is a fluent Zulu speaker, working with 9 children (5 girls and 4 boys) at Okhayeni Primary School. They are taken through a therapeutic and fun process of telling the story of their own lives and then create their own "My Hero Book". There is an HIV slant - and an aspect of what it is like being a child living in a community affected by HIV Aids, but it is mainly around what life is like and where their support networks lie, and how they have managed to overcome problems in their lives...i.e. that they are able to be their own heroes. It all culminated in a radio workshop in January - where for 5 days a group of radio journalists taught the children how to use recorders, and they then recorded bits of their lives and interviewed family and friends - in an effort to educate others in SA (and possibly further afield) about how rural SA children live. 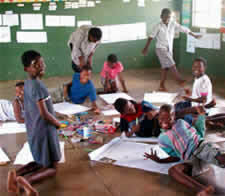 Play leaders at Manyiseni Centre have been running Soul Buddyz groups for 9 to 14 years olds. 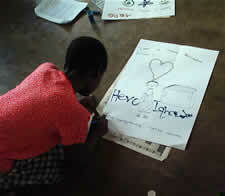 This will be replicated at the new Ingwavuma Centre and Ekukhanyeni Home in 2006. Zisize in both UK and RSA did not have the funds to employ a Zulu speaking therapist/counsellor then IBIS, a Danish charity, offered funding which enabled Zisize (Ingwavuma) Educational Trust to employ an intern psychologist, Thanduxolo Mngomezulu, who has made a huge impact in a short space of time. He has gained children’s confidence and several have disclosed to him that they are being abused and action has been taken. He is also giving counselling to bereaved children, those coping with problems in the family and those being abused. He and our volunteer Sylvia, are undertaking counselling at schools in relation to HIV testing.